With much of the world's population now an undead horde, R is a young and oddly introspective zombie. While fighting with and feeding on a human scavenger party, R meets Julie and feels an urge to protect her. What happens next is the beginning of a strangely warm relationship that allows R to begin regaining his humanity. As this change spreads through the local undead population like a virus, Julie and R eventually have to face a larger issue when the very nature of their friendship is challenged. Caught between the paranoid human forces and the ferocious "Bonies", zombies who are a mutual threat, R and Julie must find a way to bridge the differences of each side to fight for a better world no one thought possible. For the Warm Bodies 4K Blu-ray review, click here. Should you buy it and other questions answered. Warm bodies are about a zombie invasion where there is one survivor, Julie (Teresa Palmer - Wish You Were Here, The Sorcerer’s Apprentice, I Am Number Four, Bedtime Stories). Basically, a zombie named R (Nicholas Hoult - X-Men: First Class, Clash of the Titans, Coming Down the Mountain, A Single Man) saves Julie from other zombies attacking her. R then slowly starts having feelings for Julie and eventually falls in love with her. He does everything he can possibly do to protect her from the other zombies. This zombie does not talk much, so imagine the human girl and zombie communicating. It is a zombie love story that has comedy, small amount of horror, suspense, little gore, and creepy "bonies." There are two types of zombies in this movie which are your regular zombies and zombies that are called "bonies". Bonie zombies look like black skeletons and appear really scary/creepy. Here is one thing that seems kind of crazy to me, R is a smart, intelligent zombie but he still eats brains, and then after meeting Julie, he suddenly does not eat for a week - it does not go together. 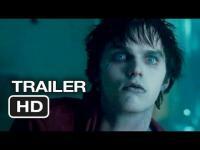 The zombies in Warm Bodies also run incredibly fast when needed and walk slow as ever in some parts of the movie. The movie lacks consistency. Warm Bodies did get interesting when Julie had to hide R from her father and from that point on, I wasn’t bored. I do like the love story behind it all, but as I said earlier, I will not be watching this movie again. R’s love did solve the zombie’s problems and turned them human again, so LOVE conquers all. My opinion - Warm Bodies is an okay movie if you have nothing else to watch and if you just want to watch a love story and not worry about the inconsistencies. Avg. Rating: 3.14/5 stars from 204,833 users.